When the temp goes up, it's time for the beach. 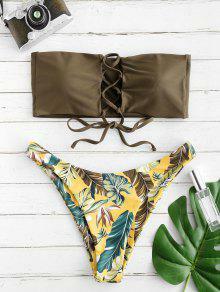 A trendy bandeau top featuring slender lace-up details on the front perfectly accents the curves with soft pads for lift. And the cheeky briefs are made with a polished mixed pattern, thus adding a contrasting look to this style.